Apple Freeze by Juice Artisan. Another day; another fabulous e-juice from Malaysia. It tastes of apple (which is the least you expect) but it is good vibrant flavour but the most remarkable aspect is the 'freeze' bit. It defies all logic how something which is generated into Vapour by heat can taste so cool. I love it. 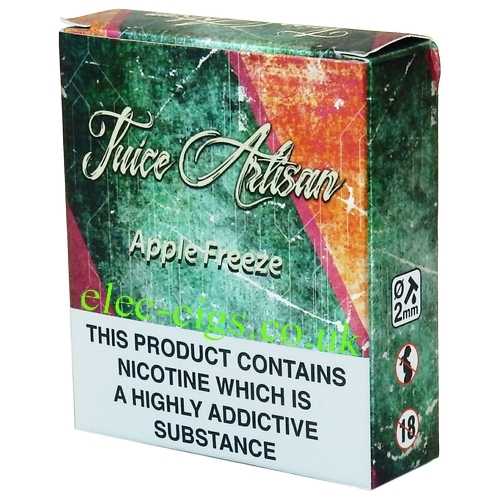 Apple Freeze by Juice Artisan is delivered in three x 10 ML, factory sealed bottles within a cardboard outer. It has 3 mg (0.3%) nicotine content and is a 50-50 (VG/PG) mix. Apple Freeze by Juice Artisan can only be purchased by adults aged 18 years or older. This product contains nicotine which is a highly addictive substance.